I am sure all parents at some point have had the dilemma of trying to keep the sun out of a child's face whilst out and about in a car seat, pushchair or pram. Have you tried keeping the sun out of their face by covering the pram with a muslin or blanket or spent your day constantly adjusting a parasol? Then you need to try a SnoozeShade! We have been testing out the SnoozeShade original for a pram/pushchair and its been fab! Evelyn is currently using the pram function on her pushchair and being a summer baby we have tried several things to try and keep the sun off her. I am sure most of you have had the struggle of using the little parasols that clip onto the pushchair, Which are fine until you need to walk, move or the sun changes directions and they then need constant readjustment! The SnoozeShade offers an end to all that! 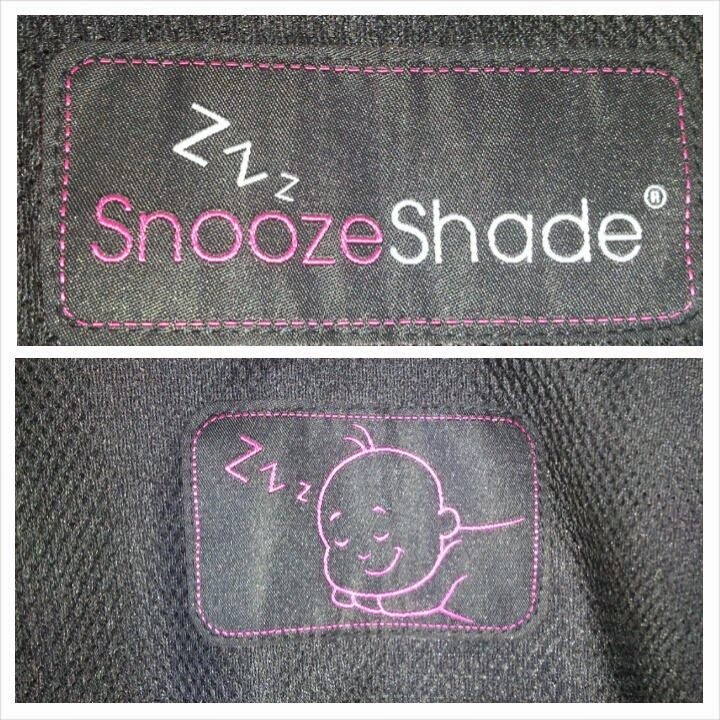 The SnoozeShade protects baby from 99% of UV rays and is approved by the Melanoma international foundation. Making any time sleep time for baby whilst out and about and no more worrying whether baby is covered up or not. The SnoozeShade original is a universal size and will fit onto all prams, pushchairs, travel systems and 3 wheelers! As well as the SnoozeShade for prams and pushchairs SnoozeShade also have a design to fit car seats and travel cots so baby can always be protected. The SnoozeShade original is priced at just £19.99 which I think is a fantastic price for something that is easy to use, high quality and protects baby quickly, easily and hassle free. Here is a short video of just how easy the SnoozeShade is to use on a carrycot (as we used it) along with some fitting tips. The SnoozeShade came in a handy bag to store it in when not being used and came with some easy to follow instructions (although if you find it easier to follow a video SnoozeShade have lots of "how to fit" videos which can easily be found on Youtube and on their Youtube channel HERE). 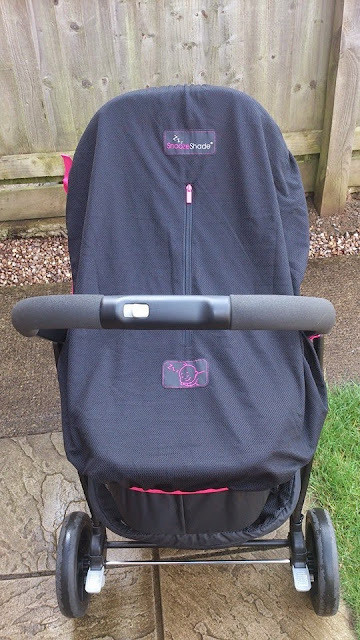 We loved the Snoozeshade and will be continuing to use it for the pram and when Evelyn moves up to her pushchair (A great thing about SnoozeShade is you only need to buy one product as it adapts from pram to pushchair!). I loved the little zipper "window" which meant I could unzip it and have a peak inside to check on Evelyn without having to remove the shade all together. 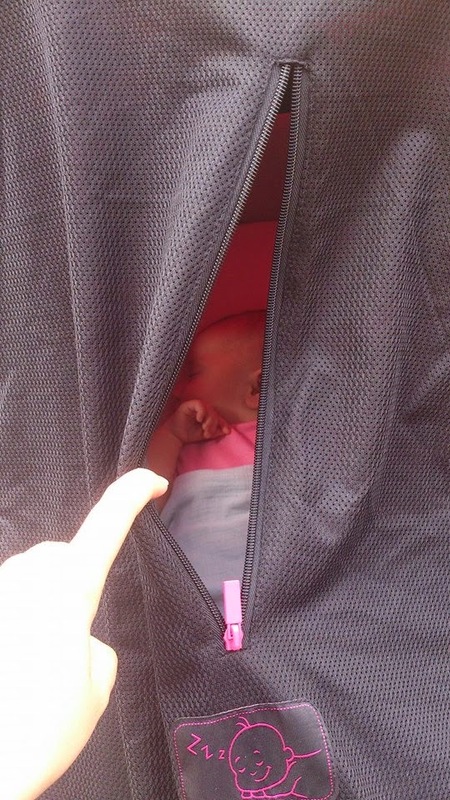 As well as protecting baby from the sun the SnoozeShade can also protect baby from insects, wind, light rain and a chill that you may get whilst out walking. I really cannot recommend the SnoozeShade enough! Have you tried out the SnoozeShade before for either pram, pushchair, car seat or travel cot? Never using one like this before but seen such good stuff about them. These are great for small babies. We used to use a muslin when mine were small! It sounds great but I don't buy into having a whole bunch of single-use specific products. A blanket doubles up as a great sunshade and stops you having a ton of redundant stuff to get rid of when they get older. Like a previous comment, I wondered how hot it gets inside the pushchair/pram with that on? It does look like a great product but I don't think I'd pay for one when like Aisha said, a blanket would work just as well. If I were pregnant with my first I probably would have done because I bought so many silly things that I thought I absolutely had to have only to find it was a waste of money! i think I'm a little bit too big to get away with wearing one of these ;) it is a great idea to keep those pesky uV rays off the little ones though! Oh, I've just bought a shade few days ago ready for the hols next week... such a shame I didn't see your post earlier. I like this shade a lot.